Learn about the temperament and personality of the Skye Terrier. Discover what he's like to live with, his traits and characteristics and how he generally behaves. And look at lots of Skye Terrier photos. 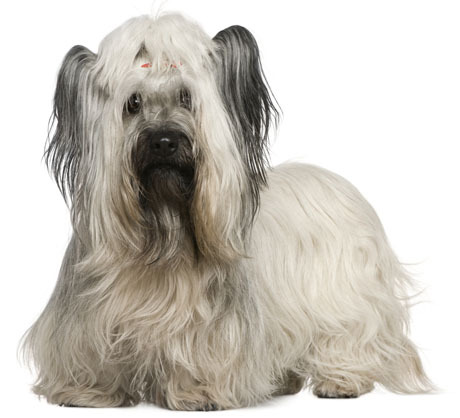 The Skye Terrier has a typical terrier temperament: courageous, canny, strong, and independent. He is fiercely loyal to those he loves, but people have to earn his love and respect -- he does not give it freely. He is selective about whom he will love and whom he will obey, but once he chooses you, his loyalty and devotion are profound. He usually attaches himself to one member of the family, whom he follows around like a shadow. He can live with children if he is raised with them. He is reserved and cautious with strangers, and can even be shy, so he needs early socialization. A Skye will not tolerate being picked up or handled by anyone except his closest loved ones. He also requires early obedience training or his independent nature can become unmanageable. He is sensitive to rebuke, but never submissive. And he is perfectly capable of holding a grudge. He is an alert protector of home and master -- always watchful. He has moderate exercise needs, and needs at least a daily walk. He also does well in obedience, rally, agility, and tracking competition. Skye Terriers are friendly and happy and are also trained as therapy dogs. He is usually quiet in the house and is content to sit beside his master for hours. He often lives peacefully with other dogs. He does not look for trouble but if he is provoked, he will not back down. The Skye Terrier can be serious and he can be clownish. He is a loving, faithful, and adoring companion for the person(s) he chooses to love. He craves attention and companionship and gives it right back. The Skye Terrier is harder to train than most other dog breeds. He learns new commands more slowly than the majority of other breeds. You will need to be extra patient when Training him. The Skye Terrier sheds a fair amount of hair. You'll find hair stuck to your couch, carpets, clothes and everything else in your home.